It was weird. And ultimately, I think that BigGuy being in Scouts and Husbeau having to be with him (we sign the blanket medical release because we have to, but we can’t really agree to it–so someone is almost always on-site with him although we are often not involved with his activities)… it’s going to be a good thing for all of us. BigGuy will gain some much needed and desired (by him) self-reliance skills. But I think Girly and I need some one-on-one time longer than just a Mama-Girly date. I have always imagined what life would be like if Husbeau died–what I would do first, how I would manage with the kids, etc. But I have never managed life if both of the boys died and it was just Girly and I. This weekend was hard. I felt so very disconnected from her–so out of touch. I’m starting to realize that a lot of my challenges in educating her come from this disconnect… this “not really knowing” her or not feeling connected by what I do know. For DAYYYYSSSS before the boys left, she pressed me over and over about what we would do while they were gone. What would we eat? Where would we go? For her, this was clearly going to be a non-stop party–squeels of joy at every turn. I honestly had no idea what we would do. There didn’t seem to be anything I could think up that I thought she would enjoy AND I might enjoy. I definitely felt on the spot to make it an amazing and unforgettable weekend. And I felt like I had failed before it had even begun. It bothered me that she couldn’t just enjoy alone time together. Saturday morning came and the boys ate breakfast with Girly while I slept. Husbeau made sure I was awake before leaving, but I allowed Girly to watch a show after the guys left so that I could sleep longer. I was exhausted. We got a slow start to the morning and went to our family’s weekend breakfast place–just she and I. She really wanted that. This kid is all about hotels and restaurants. At six. We went back home and she played with the little girl from across the street and I honestly have no recollection of what I did during that time. None. Oh, wait: I swept and mopped the stairs, foyer, kitchen and powder room. Then, I took her to the movies to see “Paddington”. We stopped for a hot dog on the way and we got a big tub of popcorn and a juice box at the theater. TOTAL treats on every point. She was happy. 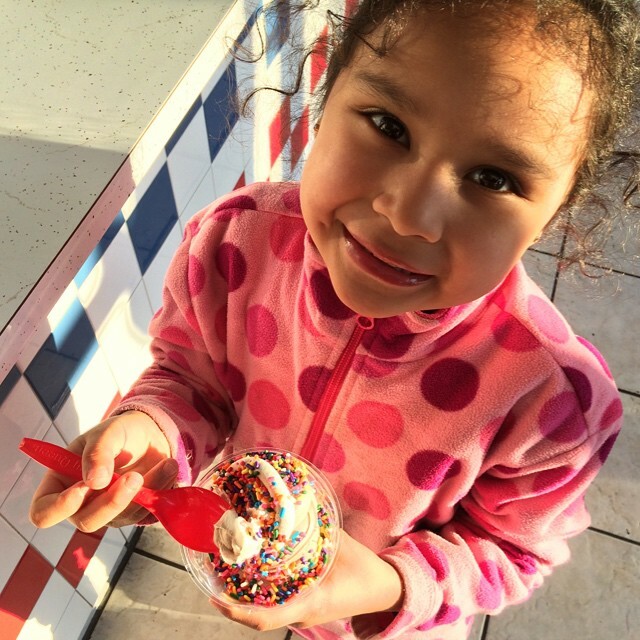 On the way home, I doubled down and took her to DAIRY QUEEN! This is essentially giving the middle finger to both of our dairy intolerances (which can tolerate a serving of ice cream if not combined with other dairy products in the same day or too many within a few days). Oh the glory… Between the dairy problems and the blood sugar problems in this household–ice cream is a HUGE treat for us. And then the dyed sprinkles… wow… jackpot. It occurs to me that the way to this kid’s heart is through contraband food. Of course, she made sure her brother knew she had food that he can’t have. She still needs to feel powerful by hurting other people (and she still pushes people away because she’s certain they will leave her ). But we’re making great strides. We need this time together–she and I. We need to find comfortable ways of just being together without there being events and activities to distract us from enjoying one another. And it all works out as it should.